Craft and livestock fairs in Galicia played a fundamental role in the development of towns and cities since the 18th century. Within the framework of a self-consumption agriculture, the rural population exchanged their scarce surpluses for products of the small artisan industry or for other products necessary for the home. In addition to livestock, cheese, butter, eggs, chickens, ‘cuncas’, ‘zocas’ and other items of rural craftsmanship were part of the day-to-day medieval markets such as Os Pendellos de Agolada. 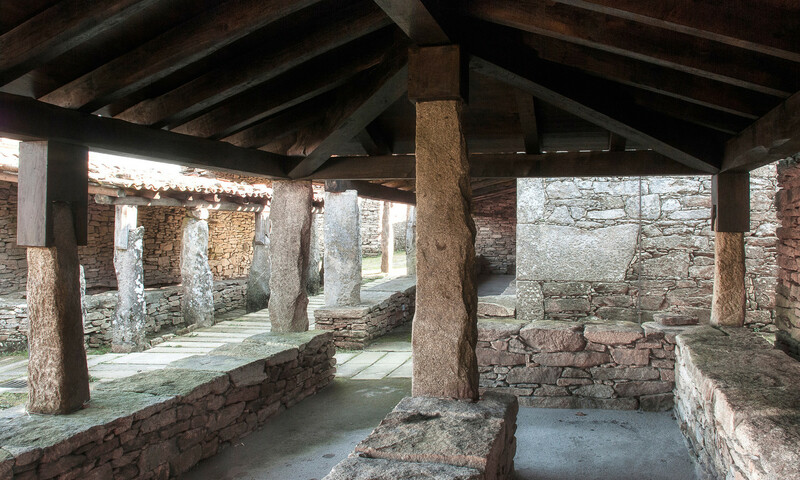 In Agolada, a town in Pontevedra that belongs to the Deza region, you will find this historical site where you can get to know a little better the life and habits of rural Galicia in the 18th century. At that time, the economy of the municipality was traditionally linked to livestock, agriculture and the exploitation of the forest. In addition, every month it held a fair dedicated to the trade of livestock, agricultural products, textiles, tools. . . known as the medieval market of Os Pendellos de Agolada. A space in which the typical ritual of barter, buying and selling, talks, haggling and other commercial tricks were celebrated. The pendellos were constructions without too much ornamentation that were strictly thought to be economic and functional. Although the RAG (Real Academia da Lingua Galega) defines them as “small constructions, normally attached to the peasant’s house, which serves as a warehouse to store firewood, the cart, work tools and other utensils”, the truth is that there were different types. (1) Those used for the exhibition of goods, covered by a roof of stone slabs that protected the products from the sun or the rain, (2) those that were used as dining rooms with -only- a roof supported on pillars and/or walls, (3) those that were used to keep the cattle or to store the articles of merchandise and that, even could have an upper floor destined to the housing and, finally, (4) others that worked as inns for those that went to the place the days of fair. However, a common feature is its simple construction, with few windows, rectangular shape and using materials typical of the environment such as granite, wood -usually chestnut- and slate slabs. After the success of the fairground, and although it remained in use until the early 70’s (20th century), its degradation and abandonment ended up causing the demolition of much of the complex. Years later, it was declared a Historic-Artistic Site and conservation work began to be promoted to conserve one of the most emblematic places in the region. Without a doubt, the market value of Os Pendellos de Agolada is not only architectural but also has an important ethnographic value for the community, and its inhabitants confirm this. Today, and thanks to the initiative of the neighbors, it is still the scene of a fair of sale of products of artisan and ecological character on the 12th of each month.